Unlike last year, Washington, DC's spectacular cherry blossom bloom is right on schedule in 2019. The National Cherry Blossom Festival attracts 1.5 million people to the capital every year. The festival runs from March 20 through April 14, but the absolute best time to go is always during peak bloom, when the pink flowers explode into a stunning display. 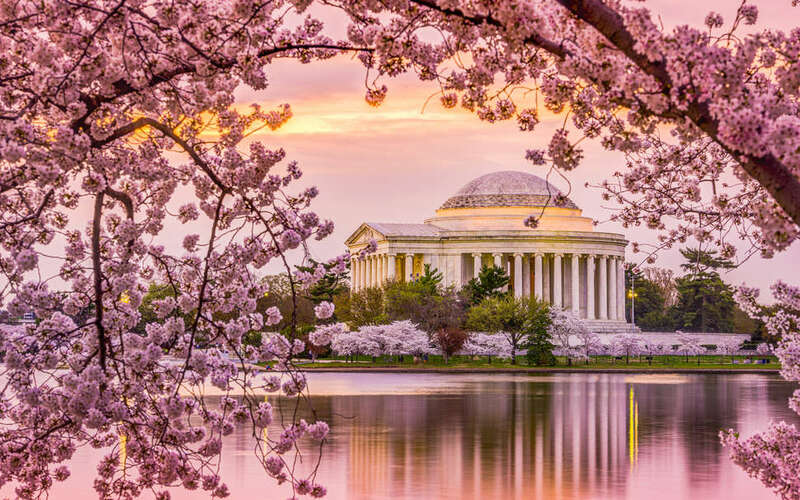 Peak bloom is defined as the day when 70% of the area's Yoshino Cherry Blossoms open around the Tidal Basin. While it's nearly impossible to accurately predict the bloom more than 10 days in advance, the National Park Service (NPS) does its best to help travelers make plans. Currently, the NPS is predicting peak bloom will occur April 3-6. That's a date range that can -- and likely will -- get adjusted based on the weather conditions. However, it does fall between the last week of March and the first week of April, which is when peak bloom most frequently occurs. The NPS does not hide how difficult it is to predict: "Forecasting peak bloom is almost impossible more than 10 days in advance," the agency's Bloom Watch site states. "The cherry trees' blossom development is dependent on weather conditions, which are inherently variable." Once the bloom occurs, the blossoms stay on the trees for around two weeks. That provides a short window in which you can walk under the beautiful display. However, the trees are vulnerable to a freeze. For instance, an early bloom in 2017 collided with freezing temperatures, killing off around half of the blossoms before peak bloom managed to arrive. So, if you're planning a trip, pay attention to what the NPS has to say. Then cross your fingers that all goes well for the dates you're heading to the capital. The NPS has adjusted its prediction for peak bloom in the Tidal Basin. It is now projecting April 1 as the start of peak bloom, a couple of days earlier than the original projection of April 3-6. The updated estimate was expected, as noted above because it's notoriously difficult to project peak bloom weeks in advance. The projection has been adjusted due to warmer than expected temperatures over the last week, as well as a warm weekend coming up in the forecast. The Cherry Blossom Watch website also added a warning noting that it's worth getting there right around peak bloom if you can. The blossoms can last a week or two, but they also become fragile as they move past full bloom. That "makes them more vulnerable to rain, wind, and storms," the site notes. "It's not unheard of for them to be mostly gone in 4-6 days." Dustin Nelson is a Senior Writer on the news team at Thrillist. Follow him @dlukenelson.